Everyone loves bears, the young and young at heart. 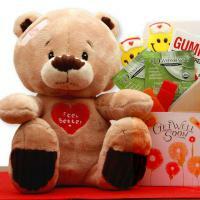 Holiday bears, get well bears, thank you bears, Valentine bears, adorable teddy bears just because. We have a bear for you. Whatever the occasion there's no better way to express your sentiments than with a teddy bear. Everyone loves bears, the young and young at heart alike. Today we can hardly imagine a world without that eager listener, confidante, and loyal friend, the teddy bear. 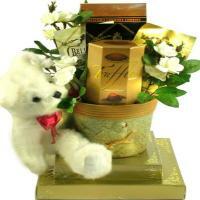 Bear gift baskets, everyone loves bears, the young and young at heart. Holiday bears, get well bears, thank you bears, adorable teddy bears. We have a bear for you. So what's next for the teddy bear? Certainly our love affair with the teddy bear shows no signs of abating. In 1999, in just the United States, collectors purchased $441 million worth of teddy bears. Certainly, as we begin our journey through a new century, we need the teddy bear's gift of unconditional acceptance, love, and reassurance more than ever. Read the complete history of the teddy bear.